Does Razer's cut-price tracker have what it takes to take on Misfit and Jawbone? It took the entire span of 2014 for the Razer Nabu to finally get an official release – albeit just in the US – but that didn't stop Razer from revealing its cheaper, younger brother, the Razer Nabu X at CES 2015. Ditching the OLED screen, on the surface the Razer Nabu X is a standard activity tracker, with a few tricks hidden up its sleeve – the biggest of which is its price point. You can pick one up for under $50 / £45. That pits it squarely against the likes of the Misfit Flash and the Jawbone UP Move. But can it compete? Read our full Razer Nabu X review to find out. 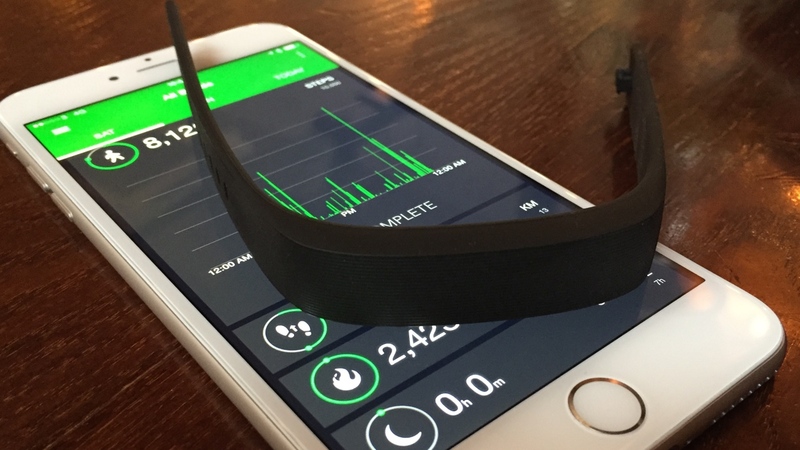 The Nabu X comes in three colours – black, white and green – we took the black one for a spin. Its setup is similar to the Fitbit Flex, whereby the hardware itself is a module that pops into an opening at the front of the strap. The module has the signature green Razer colour on its back and sides and, when you're wearing the Nabu X, you can see this fluorescent trim protruding from your wrist. The band is a rubber, texturized, number that is a one-size-fits-all. This shouldn't be a problem though as there are a number of fastening holes and the band is pretty stretchy. The Nabu X is actually one of the most discrete and comfortable fitness trackers we've tested and the build quality is far from budget. To keep the price down Razer has ditched the OLED display from the original Nabu, and it instead uses a trio of LED lights to inform the user of step goals, smartphone notifications and alarms. These lights, which can glow red, blue or green, are on the front of the module and shine through the strap. In terms of activity tracking, the metrics recorded are pretty basic – steps, distance, calories and sleep. But hey, what more did you expect at this price-point? You'd probably expect these aspects to actually be tracked, right? Sadly not. We found that on some days the Nabu X didn't record any information, on others it blanked out for periods of times and, on days when we did get a consistent reading, we found the step count to be quite a lot less than we achieved on a Fitbit Charge and the Mio Fuse. A double tap on the Nabu X is supposed to show how you're doing against your determined goal although, despite a couple of firmware updates landing, this still isn't happening on our device. A double tap simply gives us the battery level. A quick look online and it's obvious we're not the only ones suffering from this glitch – despite updating the firmware twice (which was recommended) we still haven't got the option for goal tracking. Sleep monitoring can be turned on within the app, or you can select a time period where you want this aspect to fire up automatically. For example, you can tell it to enter sleep mode if no movement is detected between 10pm and 8am. The sleep stats provide a basic overview of deep sleep and light sleep which, as we've lamented with over brand's wearables, isn't really useful…just mildly interesting. However, just like the step tracking we found sleep monitoring to be hit and miss. One night, despite visiting slumberland for 8 hours, our Nabu X recorded just 6 minutes of sleep. While there's no screen to keep you updated with your smartphone notifications, you're still alerted of calls, SMS and social interactions. The idea is you can customize the three little LEDs that to flash with different colour combos for any given notification. For example you may choose two greens and one red for a WhatsApp message. That's the idea at least. For now, you will have to make do with three green flashing lights…for everything. Essentially, any alert you have set to show up in your smartphone's notification centre will trigger three green lights and a buzz. Maybe you want email alerts on your phone but not on your wrist. Tough luck. It's all or nothing and it's three green lights every time. What this means is that you're constantly being buzzed and alerted, but you have no clue as to what until you pull your phone out of your pocket. That's pretty naff, we're sure you'll agree. An incoming call is three blue lights, and an alarm is three red lights, so at least you know what they are but the LED personalisation options can't come soon enough. The social features of the band are aspects Razer is keen to shout about and again, in theory, set the wearable apart from its rivals. The big plan is to make the Nabu devices social using Razer's Pulse platform. The idea is you can share activity data, interact with multiplayer games and even to 'high five' another Nabu or Nabu X user nearby to quickly exchange Facebook or Twitter info. However, with the amount of Razer Nabu devices in the wild so low, this is a feature-set that falls down almost immediately. You'd need mass adoption of the Nabu platform for this to take off and, despite us having Pulse turned on during our week or so with the band, we've yet to come across another user to test out the sharing functions with. The Razer Nabu app store, which we're told will be brimming with social games, so far has just one – and that's only available in China. That subheading should perhaps read, “The apps", as you'll need to download a duo of applications in order to get your Nabu X up and running: the Nabu X Utility app and the Nabu Fitness app, which is just plain daft. You'll start with the Utility app. This is where you pair the device, alter the settings, check for firmware updates, set alarms and so on. You'll then have to jump into the Fitness app to take a look at your activity stats. When initially pairing the Utility app kept telling us our device was already synced to another account, despite us having taken it straight out of a sealed box. After three hard resets, it finally matched up. In the fitness app you'll get basic breakdowns and graphs for your steps, distance travelled, calories and sleep and you can choose to view these in day, week, month or three month clusters. It's incredibly stripped back and anyone who's used a Jawbone, Fitbit or Withings app may well be disappointed by just how baron the analysis is. Razer promises up to a week's worth of battery life with the Nabu X although we found it needed a charge after around five days of continuous use. Still, that's pretty good and it charges to full from the propriety USB powered connector in just over an hour. The Nabu X will work with any Android device running Android 4.3 or above and iPhones from the 5 onwards. It's Apple Health compatible as well. The Nabu X also still waterproof, up to 30 minutes in 1m of water, which is impressive considering the low price. The Razer Nabu X is a well built, slick looking wearable that, in theory, has a feature set that belies its economical price tag. However, too much of what’s promised is either not ready or not working. The fitness tracking aspect is patchy and inaccurate, the apps are basic and buggy, and many of the more advanced features hinge on widespread adoption, which seems unlikely. The Nabu X feels very much like a work in progress and if you’re looking to spend around $50 / £50 on an activity tracker, you’d be much better off with a Misfit Flash or a Jawbone UP Move.